Solargraphy is a photographic technique, which combines pinhole photography with the innovative use of the black-and-white photosensitive paper. The article about solargraphy [español] in La revista del Instituto de Astrofísica de Canarias (page 48) by Maciej. The interview with Maciej [česky|english subtitles] about the solargraphy for Pozor vlak. The article Solarygrafia - klamra czasu [polski] by Maciej Zapiór about the solargraphy. The footage of Polish TVP 3 Opole [polish] from exhibition in Brzeg, Poland. The article in El Español [español] desribing solargraphy analemma project with Diego López Calvín. 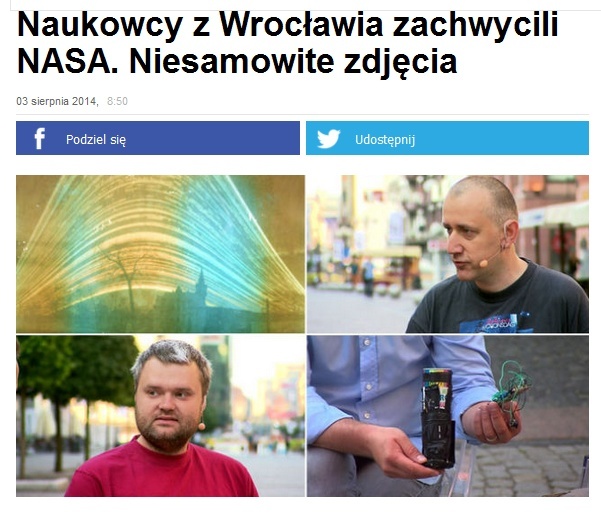 The interview in TVN24 [polski] about the solargraphy analemma with Maciej Zapiór and Łukasz Fajfrowski.